Surely you’re aware of Jupiter’s Great Red Spot. The violent storm is the planet’s most noticeable feature, defining Jupiter in the same way that Saturn is defined by its rings, and Earth is defined by its yapping apes. There’s so much still to learn about this gas giant, and the yapping apes of Earth have the tools to do it. New results from the Juno probe have revealed data about the depth, temperature, and evolution of the spot. 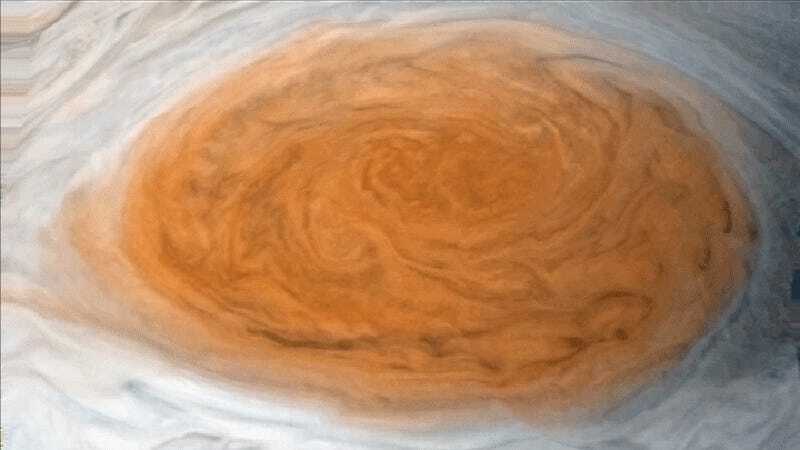 The Great Red spot is a swirling storm with wind speeds between 270 to 425 miles per hour (435-685 km/hr). It’s wider than the Earth’s diameter. But the new Juno results have added that it’s probably 200 miles (320 km) deep, too—10 to 100 times thicker than the Earth’s crust. Scientists announced these new results at the fall meeting of the American Geophysical Union meeting in New Orleans yesterday. On top of that, the spot is definitely shrinking, according to a NASA press release. The new measurements indicate that the storm has shrunk by a third in width and an eighth in height since 1979. Juno arrived at Jupiter back on July 4, 2016 after leaving Earth in 2011. It first passed over the Great Red Spot this past summer. The probe contains a suite of tools, and the most recent revelations came from its Microwave Radiometer—a device built specifically to peer deep into the planet’s atmosphere. The instrument’s ultimate goal is to understand the mysterious nature of the planet’s atmosphere beneath the clouds. Things haven’t been perfect for the probe—an October malfunction caused a setback that prevented the craft from reducing its orbital period. Scientists have still been able to publish a whole lot of research on the planet though, including nearly 50 papers back in May detailing just how weird the planet is. The science continues to flow today. Researchers at the AGU conference are discussing comparisons between Jupiter’s and Earth’s aurorae, and measurements of the planet’s gravitational field to understand its internal structure, and analysis of its magnetosphere. And if you still need your Jupiter fix after all that science, there’s always JunoCam’s incredible Jovian images, too.